Following our really successful project, Desks4Classrooms, last year, for which we thank you for supporting in an amazing way, raising nearly £9,000, this year we are again in the classroom but aiming to resource the teachers by providing good quality blackboards. Many teachers in the Primary schools in Malawi are hampered in their teaching by the lack of basic resources, such as decent blackboards to write on and chalk to write with. This detracts from effective teaching and, despite their efforts to work hard, hampers the progress of the Malawi children. We aim to tackle this problem by seeking to resource all classrooms in 10 schools with new blackboards, which will be made of thick plaster on the wall, painted with blackboard paint and have a concrete shelf for chalk and erasers. We will also resource up to 13 outside classes per school with wooden framed blackboards. 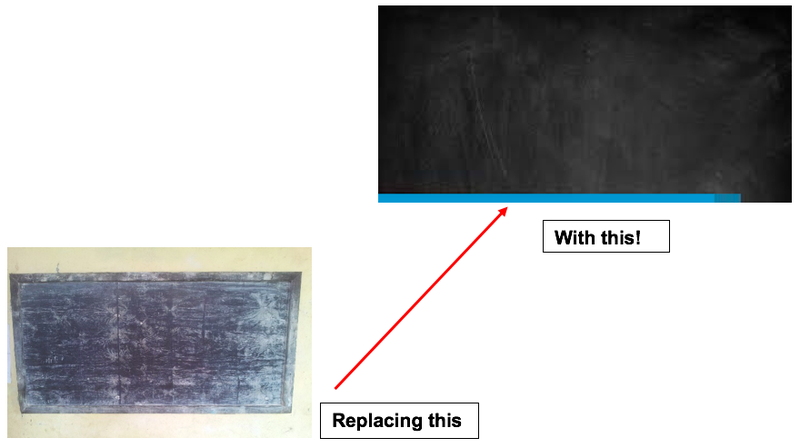 We are able to have the blackboards made locally in Malawi at a cost of £30 each. Are you able to partner with us in this project so that the teachers will be able to teach more effectively and the children reach their full potential? We have called the project “Blackboards 4 Classrooms” and really hope that with your help we can achieve our goal of equipping the schools with such a basic resource. Many classrooms do not even have blackboards and those that do are too small and poorly supported on bamboo frames. They are also damaged, making them difficult to write on and for the children to read. Many classes are actually held outside in the school grounds with either poor blackboards or no teacher aids at all. If you can you help, please visit our Just Giving page at www.justgiving.com/campaigns/charity/starfishmalawi/B4C to donate to this project.